The Evermix MixBox 2 is a hardware / software package that lets you record and share your DJ sets easily using your iOS device. The hardware is elegant and simple, but the iOS app could be improved in terms of usability. Overall an easy-to-use recording system for capturing your performances regardless of the brand of DJ gear you’re using. Recommended. The Evermix MixBox 2 is the latest iteration of the MixBox, a hardware and software combo that lets you record straight out of a DJ mixer and into your iOS device. The MixBox 2 itself is tiny and fits in your pocket (it reminds me of a can of mints). It’s got a pair of RCA jacks for hooking up to your mixer’s Rec output (or similar, depending on your mixer / DJ controller) and a socket for connecting the DIN-to-Lightning lead that plugs straight into your iOS device’s Lightning port. The Evermix Mixbox 2 comes with all the cables needed for connecting it, and comes in a zippered clamshell case that holds everything. I connected the Mixbox 2 to my DJM-900NXS mixer, connected it to my iPhone, fired up my CDJs and got to work. The Evermix Mixbox 2 is made of plastic and aluminium – it’s not heavy but it feels tough and made for gigging. It’s small enough to fit in your pocket, though you’ll want to keep it in its carrying case so that you can stash it in your DJ bag along with its cables. 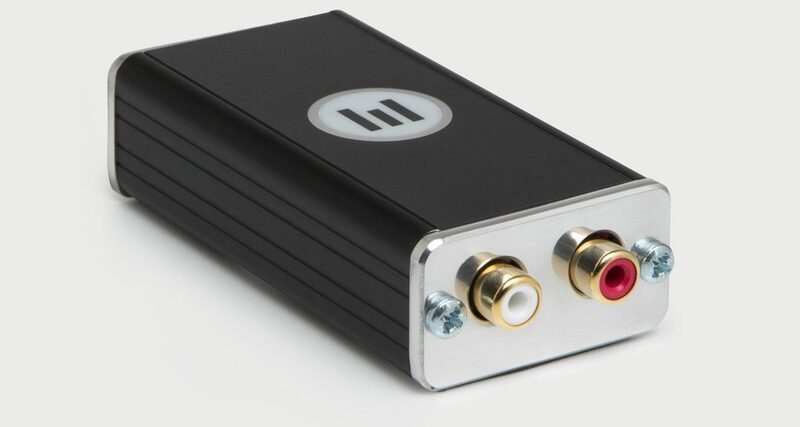 You plug it into your mixer / controller’s RCA Rec or “Session” outputs, and then you use the included 15-pin to Lightning cable to connect it to your iPhone or iPad. There are no other cables necessary, as the MixBox 2 draws power from your iOS device (the original MixBox needed to be plugged into a mains outlet). Once you’ve got it plugged into your mixer / controller and your iPhone / iPad, you then fire up the Evermix DJ app. You can then set your levels by playing back a tune on your DJ gear: when audio is running through it, the Evermix logo on the MixBox 2 glows blue and a waveform appears in the Evermix DJ app. If no audio is detected or if the levels are too low, it glows red. Looking at the Evermix DJ app and checking the MixBox 2 LED is an easy way to determine if your set-up and levels are alright before you start recording. Once done, capturing your mix is as easy as pressing the green “Record Next Set” button: I did so and played a half-hour DJ set. You can select the captured audio quality to be in 320kbps AAC, 192kbpsAAC, and WAV. The MixBox 2 has a resolution of 24-bit/44.1kHz and we were impressed with the quality of the recording – it was transparent and as clean as the sound coming out of the DJM-900NXS mixer, which really is all a DJ could want in a DJ set recording. If you’re DJing with “Hi-Res” audio files through a CDJ-2000NXS2 / DJM-900NXS2 set-up, you won’t be able to capture the full resolution of the music, but that’s verging on audiophile territory and the casual club goer or music fan wouldn’t even notice. Once you’ve finished DJing, simply press the “Stop” button. Evermix DJ will automatically process the mix and save it in the app and upload it to the Evermix DJ site, ready for you to add tags, photos and other data. You can also playback and scrub through your recorded mix here. This is where it gets a bit mired by tiny usability kinks: adding fields like Night, Location and Venue can be a bit confusing for first-timers because it seems like Evermix DJ doesn’t save what you enter in these fields (you actually have to wait a few seconds for the “Create this…” option to pop up). Adding pictures is a nice touch, though the functionality is a bit limited – you can’t view an image that you’ve already uploaded, for instance. Furthermore, the pictures don’t appear in the Evermix DJ app homepage as album art, making the experience less visual and more text-driven. All of these aren’t dealbreakers by any means, but it makes the app clunky and less slick. The MixBox 2 hardware is elegant and simple, though the iOS app could be improved in terms of usability. DJs will compare this to Pioneer DJ’s DJM-REC app for iOS, which lets you record your DJ sets when you play through supported Pioneer DJ DJM mixers (DJM-900NXS2, DJM-750MK2, and so on). The main difference with the MixBox 2 is that this works with virtually any brand mixer or DJ controller – just plug it into a Rec / Session output (or even a second pair of Master output jacks), and you’re all set. Also, the MixBox 2 doesn’t support live streaming just yet, which is something the DJM-REC lets you do straight out the box. Unfortunately for Android users, both the Evermix MixBox 2 and Pioneer DJ DJM-REC are iOS only solutions, though an Evermix DJ app for Android has been scheduled for some time in 2018. Overall, The Evermix MixBox 2 is an easy-to-use recording system for capturing your performances regardless of whatever brand DJ gear you’re using. Though it’s aimed more at DJs who spin with media players or turntables, laptop DJs will also find much use with it if they want to record all their mixes without having to resort to using their laptop DJ app’s built-in recording function, which could eat valuable hard drive space and potentially slow down their computer while they spin. Recommended. Can this used be used to stream through Facebook Live, or do you have to use their software? You can’t, you’ve got to use the Evermix DJ software 🙂 it would be nice if they added streaming to the app! Yes, you CAN use the hardware with Facebook Live to add pro quality audio (rather than the phone mic) – it doesn’t run through our Evermix DJ app software, you just open FB Live and if you have the mixbox plugged in to your phone, the stream will take your audio straight from the mixer! Thanks for the info. Why did you guys choose a din to lightning cable instead of USB to lightning? Is there a specific benefit? I have done and it works great being dedicated audio for Facebook Streaming. Why the proprietary iOS lightning cable that may or may not be compatible with the next gen iOS devices? I should be able to use the cable that comes with my iOS device. Pioneer doesn’t require me to use a proprietary cable with DJM-REC and its latest generation of DJM mixers. Can i use on android yet? We don’t think so – “late summer” is what they said, not heard anything since.